Developmental dyslexia is a language-based learning disability characterized by persistent difficulty in learning to read. While an understanding of genetic contributions is emerging, the ways the environment affects brain functioning in children with developmental dyslexia are poorly understood. A relationship between the home literacy environment (HLE) and neural correlates of reading has been identified in typically developing children, yet it remains unclear whether similar effects are observable in children with a genetic predisposition for dyslexia. 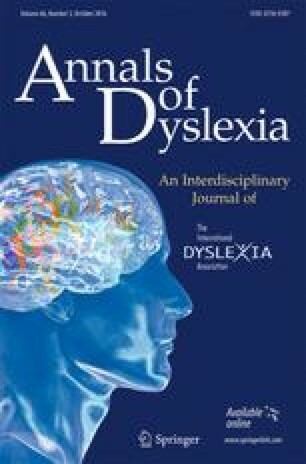 Understanding environmental contributions is important given that we do not understand why some genetically at-risk children do not develop dyslexia. Here, we investigate for the first time the relationship between HLE and the neural correlates of phonological processing in beginning readers with (FHD+, n = 29) and without (FHD−, n = 21) a family history of developmental dyslexia. We further controlled for socioeconomic status to isolate the neurobiological mechanism by which HLE affects reading development. Group differences revealed stronger correlation of HLE with brain activation in the left inferior/middle frontal and right fusiform gyri in FHD− compared to FHD+ children, suggesting greater impact of HLE on manipulation of phonological codes and recruitment of orthographic representations in typically developing children. In contrast, activation in the right precentral gyrus showed a significantly stronger correlation with HLE in FHD+ compared to FHD− children, suggesting emerging compensatory networks in genetically at-risk children. Overall, our results suggest that genetic predisposition for dyslexia alters contributions of HLE to early reading skills before formal reading instruction, which has important implications for educational practice and intervention models. Sara J. Powers and Yingying Wang contributed equally to this work. This research is supported by the National Institute of Child Health and Human Development under grant 1R01HD065762-05.